An awesome collection of short stories about the power of love.. and the love of power. My favourite story and the reason I bought this book, was "The Infamous Bengal Ming" about a thoughtful tiger who falls in love with his keeper. 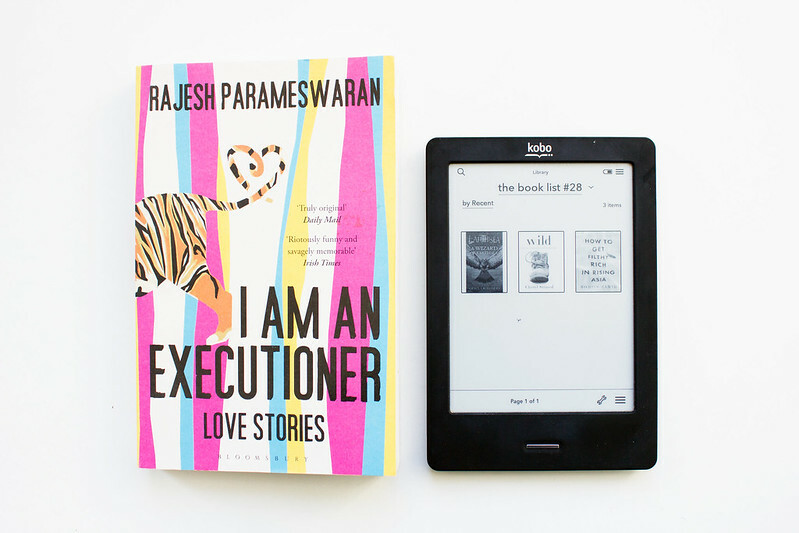 Rajesh Parameswaran's writing is powerful and amusing and I Am an Executioner is well worth reading. When Cheryl Strayed’s mother dies of cancer (pretty much the only poignant part of this book - the first twenty or so pages are raw), she struggles to cope and spirals into self-destruction. Cheryl starts cheating on her husband, sleeps with random guys, and starts taking heroin; when her marriage breaks down and results in a divorce, Cheryl finds herself metaphorically lost. She then decides to strike out along the Pacific Crest Trail with no experience, no training, and what can only be described as blind ignorance. Unsurprisingly Cheryl makes a bunch of bad decisions on the hike and I suppose Cheryl would like us to think of her as courageous; a “brave woman battling against the odds” trying to “find herself.” I just see a woman who could have got herself killed. It’s not brave or funny or courageous to set off into the wilderness unprepared, it’s dumb. Wild is, unfortunately, vacuous navel-gazing at best. Framed at the beginning of each chapter as if it were a self-help book, How To Get Filthy Rich In Rising Asia tells the story of a rural boy’s rise to the position of a corporate tycoon. The monotone voice of our unnamed narrater is so dry it’s difficult to feel any warmth towards any of the main characters. What could have been a rather moving story is transformed into a stand-offish account of one man’s life told in a rather curious but not-that-interesting manner. A Wizard of Earthsea is the first of five books in the Earthsea Cycle series, and the story tells us about a young boy called Ged, who joins a school of wizardry. During a fight with a rival, Ged casts a powerful spell that sets loose a terrible shadow into the world. Well written with a good plot, A Wizard of Earthsea is a pretty good young-adult fantasy novel and I will definitely be returning to read the rest of this series. Thanks for sharing! I'd like to give them a try, though. Reese Witherspoon is in the movie version of Wild and is nominated for an Oscar. I have no desire to see this movie. I have a really hard time with these Eat-Pray-Love type memoirs, unfortunately. I couldn't get into Wild and finally gave up. I am an Executioner looks like a good read! I understand the premise.. I appreciate feeling stuck and having the courage to do something big and drastic to change it.. but going off on the PCT with absolutely no training is STUPID, she could have died. Personally, I don't admire that. I admire people taking risks but this was just dumb, dumb, dumb. Wild just made me roll my eyes from start to finish. Have you watched Tales of Earthsea, by Studio Ghibli? Not my favorite movie (I love all their movies, but this one doesn't particularly move me) I guess it was inspired in the Wizard of Earthsea book.